Here is a typical scenario. Heavy pool table located upstairs, left behind by former homeowners. Was this just a nice gesture on the seller’s behalf? Or did they realize how much money it would cost them to disassemble and move this monster one piece slate downstairs and to another dwelling? We’ll never know. 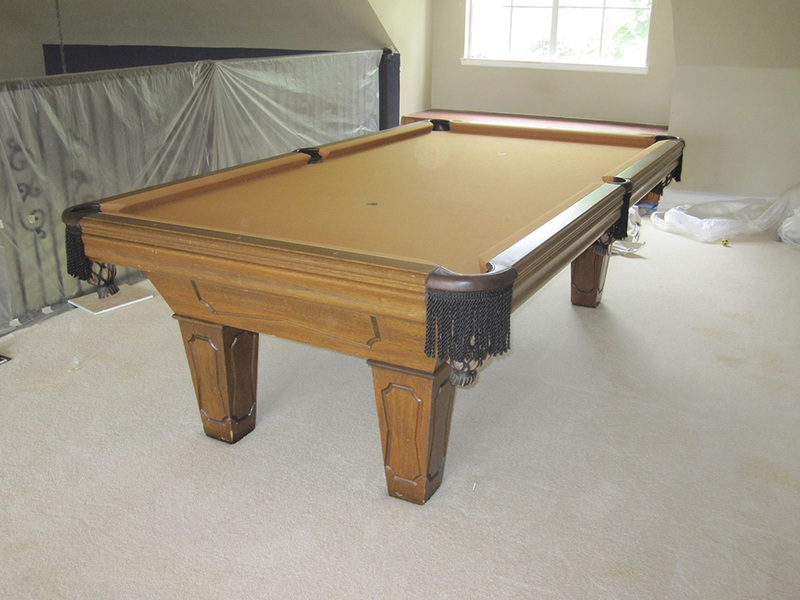 But anyway, back to this eight foot one piece slate pool table that my clients just inherited with the purchase of their new home in Villa Park, CA. 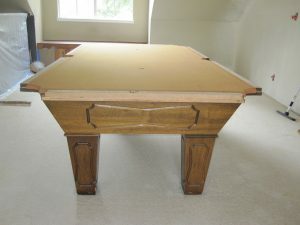 My clients are doing some remodeling and hired us to come in and dismantle this circa 1970’s slate pool table. Luckily for our backs there was an adjacent closet just around the corner which we were able to use for storing the slate, frame and legs of the pool table. 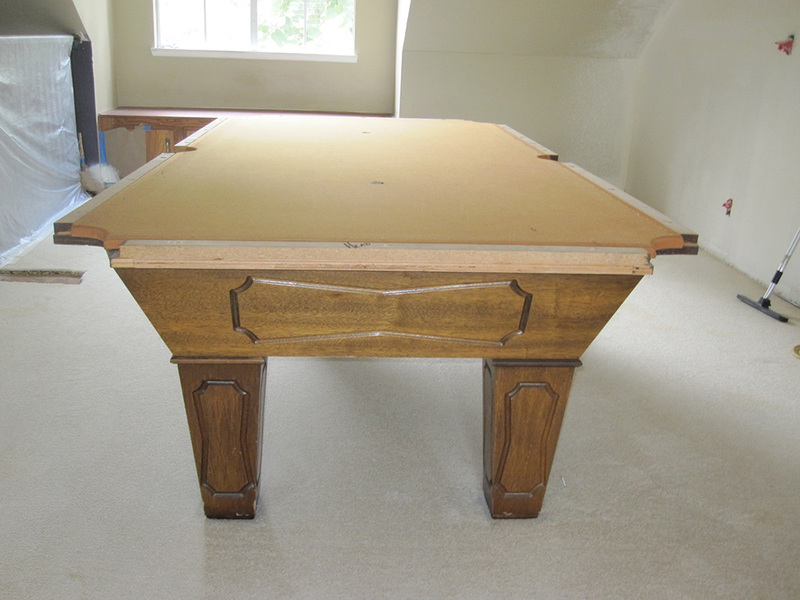 This pool table was probably purchased new by the original homeowners. The pool table still had the original gold colored felt on it, so I knew that the cushion rubber was probably original. I pulled out one of the balls and did a bounce test. The ball hit the cushion with a thunk sound and did not even make it halfway back to me! These cushions have probably been “dead” for almost a decade. Needless to say these rails were coming back to the shop with us, we blanket wrapped them and put them in the van. One thing that I was amazed with was the leather pockets, all six of them were in surprisingly good condition. The pockets were also of the same vintage as the pool table, which would put them at around 35 years old. Usually the leather nets dry up and crumble into pieces when we detach them from the bottom of the table. Exceptionally good hide must have been used in making these pockets. I’ll post some new pics of this pool table when we go back to the house to finish up the job.